Barnabas Iorheghem, Esq., LL.B, B.L. Joy M. Ahwen (Mrs.) Esq., LL.B, B.L. Tomnsan Ikachit (Mrs.) Esq. LL.B, B.L. Georgina Ukaha (Mrs.) Esq. LL.B, B.L. Jerry Dabo, Esq., LL.B, B.L. REVIEWERS: DELE ADESINA, SAN; GARBA PWUL, SAN; DAVID O. EZAGA, SAN. Published in the year 2016, the book “S.T. 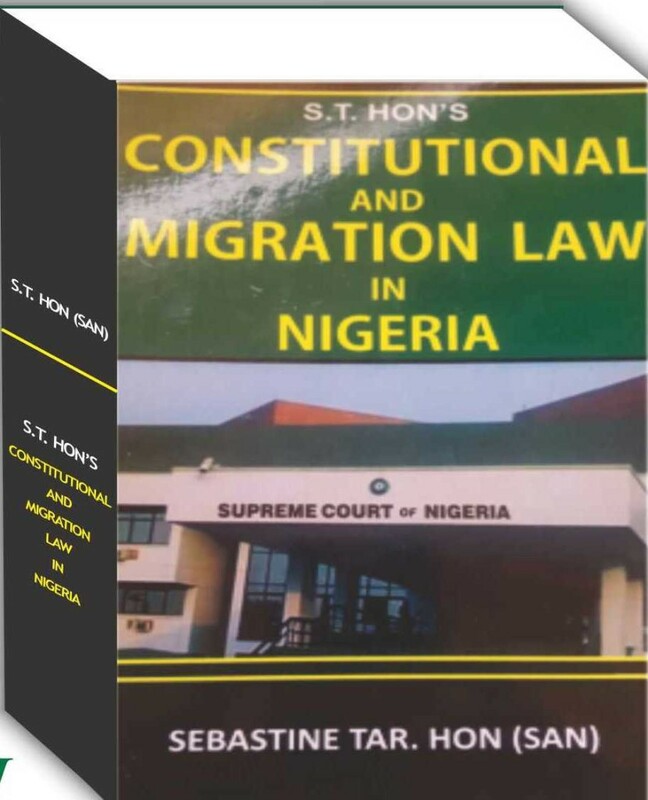 Hon’s Constitutional and Migration is, in our humble opinion, the most authoritative book on the subject-matter in Nigeria today – it being a well researched, well arranged and up-to-date book, written by a very seasoned legal practitioner and author. Broadly speaking, the book has discussed all the provisions of the Constitution of the Federal Republic of Nigeria, 1999 as amended, with the support of very relevant and current judicial and scholarly authorities. Chapter 1 of the book has traced Nigeria’s constitutional history, and has also provided tens and tens of principles of constitutional and statutory principles of interpretation, as formulated by the courts. Major words used in the Constitution and which have been given judicial definitions have also been reported and discussed extensively, providing the reader with a very good legal foundation to understand and interprete the provisions of the Constitution. Chapter 2 entitled “General Provisions of the Constitution of the Federal Republic of Nigeria, 1999 and Distribution of Federal Powers,’ has discussed the constitutionallyenshrined separation of powers, democracy at the Local Government level, amendment of the Constitution, and binding nature of treaties. The powers of the Legislature, the Executive and the Judiciary, have been discussed. Here too, the author has demonstrated his deep research – by supplying very relevant and current authorities to cover the topics and subtopics discussed. Chapter 3 has also discussed in admirable detail, the provisions of the Nigerian Constitution on ‘Fundamental Objectives and Directive Principles of State Policy,’ outlining and deeply covering the respective duties of the State and the people. Here again, the author has inter-mixed local and foreign decisions, to bring out the best possible interpretation of the provisions. To be specifically noted is Chapter 4, which has discussed ‘Citizenship, Migration into Nigeria, Refugee Entry and Movement, Extradition and Movement of Persons within the ECOWAS Sub-Region.’ Inherently and naturally discussed alongside extant provisions of the Constitution, are relevant provisions of Nigeria’s Migration, Extradition and Refugee Laws vis-à-vis those of foreign countries like Canada, the United Kingdom, etc. Also discussed are international and regional instruments, like the ECOWAS Treaty of May 28, 1975, the UN Geneva Convention on the Status of Refugees, the UN Charter and various Declarations, Etc. Current case law has been supplied by the author, to back up his discussions. 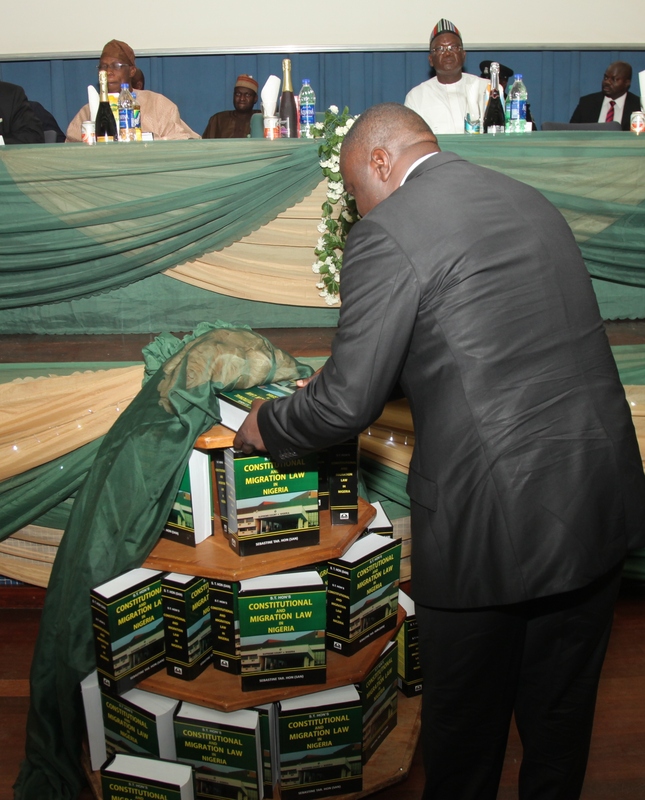 Of critical importance, too, is Chapter 5 of the book, which, spanning pages 307758, is christened ‘Fundamental Rights and Fundamental Rights Enforcement Procedure.’ The author, quite commendably, has dug very deep into the fundamental rights provisions of the Nigerian Constitution (Chapter IV thereof), discussing them with innovative legal skills. Of particular note, is the author’s discussion on comparative international legal instruments – like the European Convention on Human Rights, the Constitutions of the US, the UK, India, Pakistan, South Africa, Canada (the Constitution Charter), the UN Charter on Human Rights, etc. The amazing research capability of this author, is on full display in this Chapter – where very current judicial decisions of superior courts of record in Nigeria, and of all the above-mentioned countries/international judicial bodies, have been cited and discussed. To the best of our knowledge, this is probably the first time a book on Constitutional Law in Nigeria, has discussed extensively, topics and subtopics like ‘Duty and Obligation of the State to Protect Life;’ ‘Surrogate Pregnancy and Assisted Reproduction;’ ‘Parents Rejecting Medical Treatment for their Children’ and Euthanasia, Mercy Killing and Assisted Suicide’ (under Right to Life); ‘Unauthorised Photography;’ Unauthorised Publication of Personal or Confidential Information or Data’ and Medical Privacy’ (under Right to Privacy), etc. The author has discussed all these and many more in Chapter 5, supporting himself, quite commendably, with current local and foreign decisions. Chapter 5 has also done annotations on the Fundamental Rights (Enforcement Procedure) Rules, 2009 – again, with the support of relevant decisions of superior courts. In view of the fact that these Rules have not been exhaustively tested in our appellate courts, the author’s innovative reasoning is a most welcome effort, that will ease the work for law students, practitioners, researchers and Judges. To be specifically and specially appreciated, is the fact that the author has discussed even current decisions on the said Rules. We boldly state that, to the best of our knowledge, no book either on Constitutional Law or Fundamental Rights, has covered this much ground on the subtopic as S.T. Hon’s Constitutional and Migration Law has done. Chapter 6 of the book discusses the Legislature. Subtopics like the Composition and Staff of the National Assembly, Procedure for Summoning and Dissolution of the National Assembly, Qualifications for Membership of the National Assembly and Right of Attendance; Elections into the National Assembly; Power and Control by the National Assembly over Public Funds; and similar provisions as they relate to State Houses of Assembly, etc, have been discussed. This Chapter, also supported by the most current decisions of superior courts of record in Nigeria and outside the shores of Nigeria, spans over 73 pages. The Executive Branch of Government is discussed in Chapter 7 of the book. Commenting on section 130 of the Constitution, the author quite correctly, likens the Nigerian President to the USA President, who is clothed with executive powers, making him the head of government as well. The authority of A-G OF THE FEDERATION v ABUBAKAR (2007) 10 NWLR (Pt. 1041) 1 at 85 and the US decisions of UNITED STATES v PINK, 315 US 203 (1942), UNITED STATES v BELMONT 301 US 324 (1937), etc, are cited by the author in support. Providing recent cases and scholarly commentaries, the author has discussed subtopics like Establishment of Office of the President, Qualification and Procedure for Election of President; Tenure of Office of the President; Death, etc, of President-Elect Before Oath of Office; Disqualification from Contesting for Office of President; Presidential Election Tribunal, Office of the Vice-President; Removal of President and Vice-President from Office; Permanent Incapacity of the President or Vice- President; Acting President During Temporary Absence of President; Appointment of Ministers and Ministerial Responsibilities; Attorney-General of the Federation and Public Prosecutions; Appointment and Powers of Special Advisers; Public Revenue; Code of Conduct of Public Officers; Pension Rights, Presidential Pardon, etc. Corresponding provisions of the Constitution with respect to the States, have also been amply discussed. Also discussed under this Chapter are ‘Presidential Control of the Armed Forces and the Police;’ ‘ Formation, Registration and Regulation of Political Parties by the Independent National Electoral Commission, INEC;’ ‘Role of INEC in Elections,’ etc. Chapter 7 also discusses the Judicature or the Judiciary. The establishment, composition, jurisdictions and powers, etc, of the Supreme Court of Nigeria, the Court of Appeal, the Federal High Court, the National Industrial Court, superior Courts of the FCT Abuja, State High Courts, the Sharia Court of Appeal, the Customary Court of Appeal, the Code of Conduct Tribunal, etc. have been discussed in great detail. We hereby state that, the three Alteration Acts to the 1999 Constitution, have affected the Judiciary more than any other branch of government; and the author has again lived up to his billing, by discussing all the various amendments – with the support of current decisions of courts of record. Also discussed under this Chapter are the appointment and discipline of judicial officers, reference of questions of law to higher courts, etc. The last Chapter is christened ‘Federal Capital Territory, Abuja, and General Supplementary Provisions.’ It has discussed, with the support of both local and foreign decisions, the Establishment and Status of the FCT Abuja, Procedure for the Declaration of a State of Emergency (where judicial, historical and empirical happenings in the USA, Pakistan, Sierra Leone, etc, have been admirably and fittingly discussed); Resignation from Office of the President, etc, Restriction on Legal Proceedings against the President, etc, Existing Laws, Savings/Transitional Provisions of the Constitution; Interpretation of the Provisions of the Constitution, etc. General conclusion: S.T. 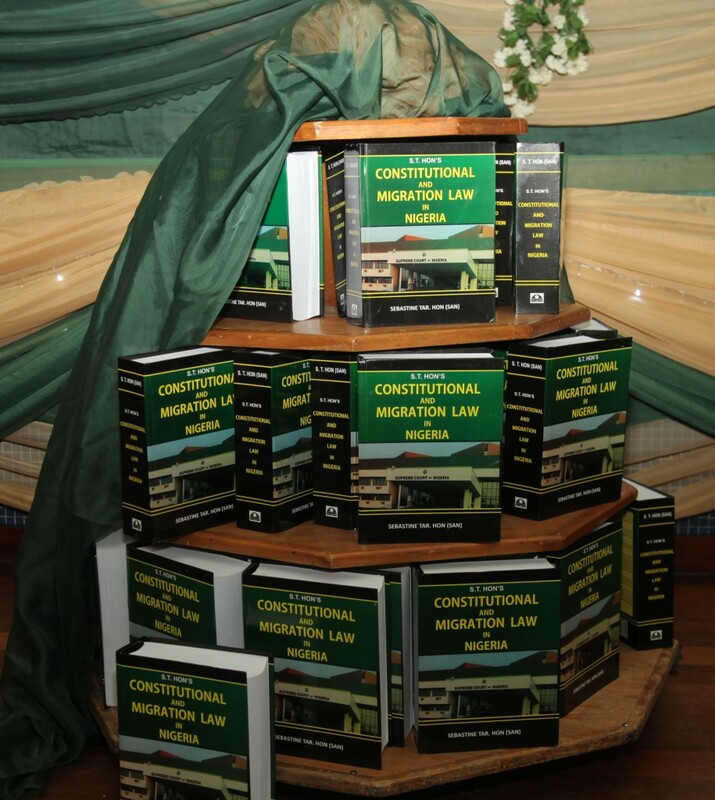 Hon’s Constitutional and Migration Law in Nigeria, is a massive monograph of 1,229 pages. It has discussed over 2,500 reported and unreported decisions of courts in Nigeria and abroad. It has also discussed tens and tens of comparative provisions of foreign constitutions and international legal instruments. It is an up-to-date source material that is a must-acquire for every person – since the Constitution affects all.